Visitors are transported to an era when the clip-clop of horse hooves on the streets preceded the roar of automobile engines. Joplin's wealthiest and most influential citizens built these homes during the late 19th and early 20th centuries. Residents of the district have restored many of the structures to their former glory. Our history: In 1992, the City of Joplin designated Sergeant Avenue from Second Street to Fourth Street as the "Murphysburg Residential Historic District." At the request of homeowners in the adjacent neighborhoods, the City of Joplin expanded the historic district in 2004. The historic district encompassed Sergeant Avenue from First Street to Seventh Street and Moffet Avenue from First Street to Fourth Street. Rosin, an architectural firm conducted the Murphysburg survey in 2015. The Missouri Advisory Council on Historic Preservation voted to place Murphysburg Historic District on the National Register of Historic Places later that year. 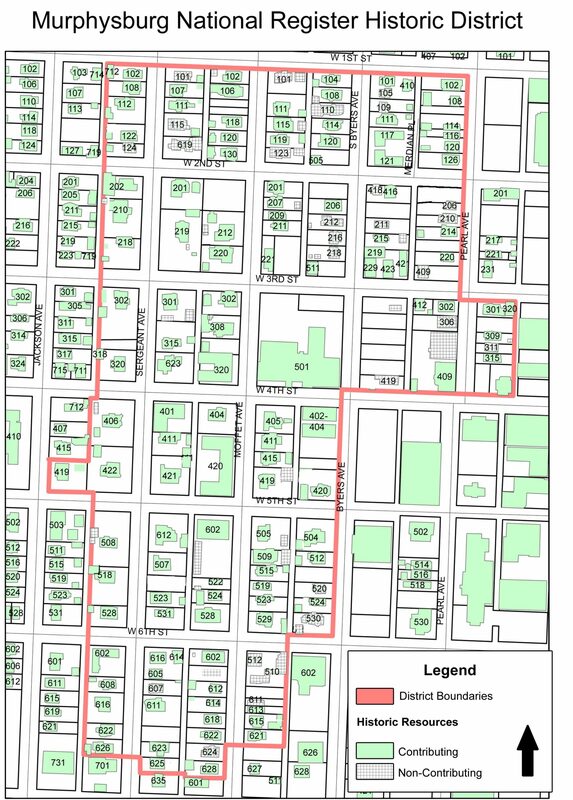 is comprised of thirteen full blocks and nine partial blocks roughly bounded by West First Street on the north, Pearl Avenue and Byers Avenue on the east, West Fourth Street and West Seventh Street on the south, and the rear (west) property line of resources fronting South Sergeant Avenue on the west. Historic Murphysburg Preservation, Inc. was formed in 2005 for the purpose to implement charitable and educational activities that promote and stimulate historic awareness throughout the neighborhood. HMP, Inc. is a non-profit 501(c) (3) corporation governed by a volunteer board consisting of seven people. The organization is dedicated to the preservation of historic homes in Joplin's only designated residential historic district. Past and present board members are personally and financially invested in historic preservation via historic home and business ownership. Their board members are involved in the City of Joplin Historic Preservation Commission, Missouri Preservation Board, Joplin History and Mineral Museum Board, Convention and Visitors Bureau Advisory Board and Ozark Gateway Association of Realtors. Many members have higher education ranging from theological to business and history degrees. Houses are designed in a variety of styles, from Colonial-Revival, Queen Anne, Romanesque, to Dutch Colonial, Classic Four Square and Prairie Style. Stroll the tree-lined sidewalks and discover unique architectural elements that give each place its own individual character. Many of the homes boast original wrought-ironwork, grand staircases, ornamental plaster-work, stained glass windows, fireplace mantels and decorative woodwork. In addition to the array of residences, the district includes some of Joplin's most beautiful churches. Whether you are a history buff getting your kicks on Route 66, or a connoisseur of architecture, you are sure to enjoy the Murphysburg Residential Historic District.